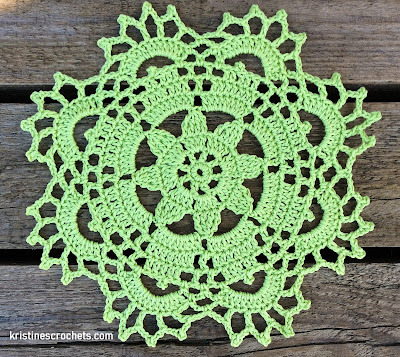 Would you like to learn how to crochet this cute Sunshine Doily Placemat? Here you will find the written instructions for the doily placemat as well as a video tutorial. Size: The doily placemat measures 28 cm (11 inches) in diameter. DK weight cotton acrylic blend yarn, size 3 - light. I used Nako Calico yarn. 25 grams of yarn needed for this pattern. 4mm (US size G/6) crochet hook. ch4picot - ch4, insert your hook into the center of the base stitch (or, insert the hook into the first ch), yarn over, pull through all loops on the hook. Start with ch5, join with a sl st. into the first ch to form a ring. (1dc into next st., 2dc into next ch1 space)* repeat 15 times around. (skip 1st., 1dc, ch2)* repeat 23 times around. (1sc into next st., 2sc into next ch2 space)* repeat 23 times around. (skip 2st., 1dc, ch3)* repeat 23 times around. (1dc into next st., 3dc into next ch3 space)* repeat 23 times around. (skip 3st., (1dc, ch2, 1dc) into next st., ch2)* repeat 23 times around. (skip next ch2, 5dc into next ch2 space, ch3, skip next ch2, 3sc into next ch2 space, ch3)* repeat 11 times around. (skip 1 st., skip ch3, 2dc into same st., 1dc, (1trc, ch4picot, 1trc) into same st., 1dc, 2dc into same st., ch3, skip ch3, skip 1st., 1sc, ch3)* repeat 11 times around.